Welcome to another "Committee Corner". We hope that you will find these updates useful, and also by sharing them around, you will get different perspectives from each of our AC members. I think most people in the agility world know me, but as a quick introduction, I have been involved in the sport for 21 years now. I started at just 12 years old (I was a junior before JDT was a thing) at the Rotorua club. I have run Border Collies for the entirety of my time in agility - although with varying success. My first dog took 5 years to qualify for Senior and my second dog never had a win or made it out of Starters. 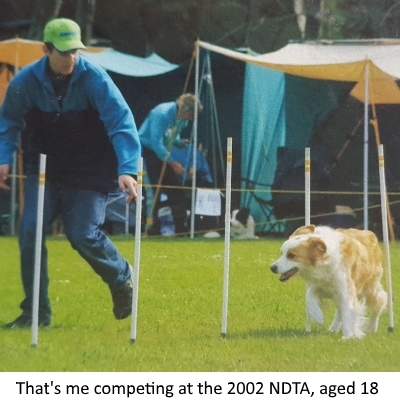 I learned huge amounts with both dogs and was fortunate enough to make my third dog up to Agility Champ although his agility career was pretty stop-start due to lots of injuries and he retired when he was 8. My current dog has surpassed all my expectations by gaining her jumpers Champ title at just 3 years of age and just being an amazing dog who seems to excel in spite of having me as a trainer. So whilst I have stuck with one breed, I can certainly relate to a lot of different types of dogs and the challenges that come with them. I am currently president of Waikato Agility Group, and was the event manager for the 2017 NZ Dog Agility Champs in Kihikihi. With both of these, I was/am lucky to be part of a supportive and high performing committee, and I am really looking forward to having the same with the new AC. One of the big reasons I wanted to join the AC was to provide support for our clubs. The previous AC set up a Club Trainers Subcommittee to respond to a desire for better training systems and information to clubs. The new AC has broadened the subcommittee's scope to make it more about providing support to clubs so that all competitors have a local club that can provide them with the training and advice they need to excel in agility. I personally believe that clubs are the cornerstone of our sport, and that we should keep a strong focus on supporting clubs in everything we do. It is worth remembering that our clubs recruit and train new members in the sport, as well as run all our competitions for us. I will be chairing the Clubs Support Subcommittee and working with Teresa, Sarah, Chris, Claire, Sallie and Emma to start the process of providing great support to all our clubs. We want to work alongside clubs to learn what they are doing well with, and what their current challenges are. By doing this, we feel we can more actively support our clubs, so they remain the first port of call for the majority of our competitors to go for their training. You may have recently filled out a survey about club training, and we will also be gathering info from clubs directly to see what the main challenges they face are. The AC will also be continuing with having each of our members assigned to clubs as a first port of call. The new AC is very evenly dispersed across the country, so there should always be one of us who isn't far away! We want to make sure that clubs feel they have a local representative who they can call on for help. If you want to see which AC member is responsible for your club, please check the website. Having good communications between the AC and the rest of the sport is critical. We are going to try our best to communicate to you in a way that is meaningful to you. Facebook has been a great tool for getting info out quickly but it often takes on a life of its own and can get emotional and nasty as people take things personally. You may have noticed that we have set up a new Facebook profile called "Acey Voice" which will be used whenever the AC wants to post official information to the Facebook group. This is an attempt to de-personalise information coming from the AC so people pay more attention to the message rather than the messenger. We will also be looking to provide more updates like this one, and doing more engagement with people face to face rather than pumping out too many surveys. We know that there are some groups, such as clubs, judges and measurers for who it is worth having more in depth discussions, as these are the groups we rely on to implement the decisions we make. But mostly we hope to create a better dialogue between the AC and everyone else. Often it can feel that the AC only talks to people when they want something (like for you to fill in a survey), but there is no reason we cant be having more and better ongoing conversations so we can all make decisions together that everyone feels more confident about. Its a bit of a new way of doing things, and we know there will be some bumps in the road, but we are keeping a very open mind and hope you will too. If you want to chat to me about the issues raised in this update, I would be more than happy to do so - my contact details are on the website - or just catch up with me at the next show you see me at!